SPSS Explained provides the student with all that they need to undertake statistical analysis using SPSS, guiding the student from the basic rationale behind the statistics, through detailed explanations of the procedures, and finally to all aspects of the SPSS output. The SPSS output is explained in a unique way: for each part of the output the explanation is divided into both an essentials section and an advanced section. The essentials section covers the basics that the student will need to write up statistics for a research report. The advanced section provides the more advanced student with an explanation for every part of the output to help with further understanding of the statistics. SPSS Explained is supported by Perry Hinton's highly successful textbook Statistics Explained which outlines all the major statistical tests used by undergraduates in psychology and the social sciences. Both books will be warmly welcomed by students at all levels, and by the lecturers who teach them. The authors collectively have many years' experience of teaching statistics to undergraduates in the social sciences. They all have current teaching expertise and deal with student SPSS questions on a daily basis. 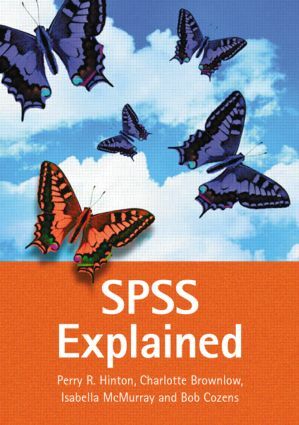 Introduction to SPSS. Levels of Data. Data Entry. Working with the Data Set. Descriptive Statistics. Illustrative Statistics. T-Tests. Independent ANOVA. Repeated Measures ANOVA. 2-factor ANOVA. Sample Non-Parametric Tests. Non-Parametric One Way ANOVA. Chi-Square. Linear Correlation and Regression. Multiple Regression. Factor Analysis. Questionnaire. Glossary. Index.